I'm just not sure if I like this sock done in this pattern. I have a feeling I'd like it more without the texture. I'd hate to rip out after all the work I've done though! Hmm... what to do? What to do?? :) Maybe I'll sleep on it before I make any rash decisions! Well I like the ribbed effect that you've done. It'll certainly be a lovely warm pair of socks when you've finished. 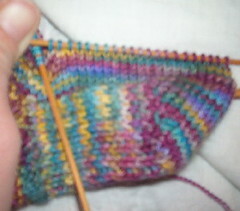 The colours are gorgeous and I think the ribbing brings them out more than the plain bit.